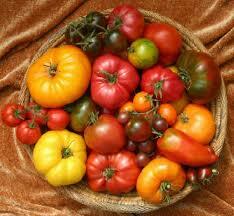 Helpful Food Storage Items: Today's Feature Tomatoes! Today, I thought I would deal with one of the most useful and popular of all storage products: the canned tomato. These can be store bought, home canned, whole or pureed but they are one of the most useful of all storage products to keep around to keep your food interesting. If no one in the family is allergic to them (and find out now, because it is a rather common allergy and you need to know about it) they can provide an almost endless list of savory ways to brighten up the storage diets of vegetarians and meat eaters alike. You can also work on making up various home made herb and spice combinations that will save you even more time in a crises or just having a busy day but that will be another post. For now, as long as you have the basics: onions (dried or fresh), garlic (dried of fresh), oregano, rosemary, chili pepper (again fresh or ground) and a few options like cumin, curry powder and cheese (store bought, home made, fresh or dry) you can do a huge amount of different dishes. Also, tomatoes are important because they are the only "vegetable" that is really a fruit and there fore safe to water-bath can in a Kliner, rubber ring or jam jar with a proper lid (a new one with a seal on it, Lakeland catalog has these in the UK). Yellow or very sweet tomatos are safer when canned with a tsp of citric acid or lemon juice in them. But they may be the one savory item you can safely put up without access to a North American Pressure Canner or making a pickle. Canning tomatoes, is again another entire post, but there are lots of good information on the web. Pretty much, you use a jar that will seal and boil the tomatoes or tomato sauce for up to 30 minutes. You can't really add anything to this without a pressure canner (other than salt) but it sill allow you to keep your garden grown tomatoes even if the climate is too wet to really dry them. Not to mention, they are a lot better than most store brands. Be sure to follow directions EXACTLY for good canning and this is one case where you NEVER want to use grandma's old Time methods because sometimes they fail and people can die. Much less likely with tomatoes than many other foods, but doing it the right way is pretty easy anyway. Folks in North America have a much easier time getting good Mason type jars and Pressure canners, they can make and can larger versions of the sauces below. There are also many good recipes in the Ball Book of Canning and many websites. Anyway, so that's taken care of, lets get to what you can do with canned tomatoes? I tend to keep three types of tomatoes in my storage area: canned whole tomatoes (store bought and home grown), crushed tomatoes (store bought or whole) and store bought tomato "puree" called tomato paste in North America. I find my family uses this last one the most often, because it is so thick it makes a good base for pizza. It is a highly concentrated sauce that I have never had enough garden tomatoes to be able to make from scratch. Basic whole or crushed tomatoes are perfect for using in soups, stews, chillies, and the every popular UK/Ireland Pasta sauce. You can make something that tastes a whole lot better than those little jars you buy in the shop with a brand name on them and save money at the same time. Often it only takes about 10 to 20 minutes longer than opening a can. Some sauces taste better if you cook them longer, but they almost always still taste better than store bought. You can experiment with different herbs and spices to see what your family likes then make up mixes so you don't have to measure every time. Remember a sauce you can pour over your pasta, you can also pour over you chicken or pork chops instead of buying something labeled "Chicken Ready-Meal Sauce" in the store. Cover with foil and bake on a low heat for an hour, brown the meat first and it will taste even better. Use oregano for an Italian taste, chile for Mexican and curry powder for sort-of Indian. In a real hurry, sprinkle herbs over the meat and pour on a can of crushed tomatoes. This works well with leftovers too. Now, we get to the wonderful world of tomtato puree, which I buy in little cans that help me measure it. Here are my too basic recipes that I use as the base for many things. The Italian one is perfect for pizza, just place on a pizza base (make the savory bread dough from the bread post) or even French Bread then add cheese and other toppings. Cook in hot (200 degree) oven for about 12 to 15 minutes. Pre-baking the crust makes it less soggy, but this is a matter of personal taste. For Mexican, you just changes the herbs around and it is a prefect base for chili or sauce for burritos, soft tacos etc. Combine everything and bring to a boil, then simmer at least 10 minutes. Taste for heat, if you like it hotter add more chili. You can also add cans of mild or hot green chilies to this. Be sure and check your "chili" powder most UK brands have other stuff (like cumin) in them so you may want to add less. Both sauces can be experimented with, and both can have black pepper added. My husband can't eat it, so I tend to leave it out. An "Indian" version could easily be made with home made or store bought curry powder. Onions and garlic can be fresh, but if you want a smooth sauce you will need to use a hand blender before serving. If using fresh onions and garlic they taste better if they are lightly cooked in butter or olive oil first. The same if you end up using fresh tomatoes, which can be fun when making pasta sauce during the gardening season. Well, that's a start on stored tomatoes. There are lots and lots of other things you can do with them but this should inspire you. Rather than buy lots of pre-made sauces for storage, get the basics and some dried herbs and spices instead. Much more variety and trust me, in a long term crises that is very important. People will start seeing meals as one of the most important parts of their day and good cooking and eating can help stave off depression as well as keep people healthy.